Baxter Ford is Nebraska’s only ROUSH Performance dealer. We’re your source for quality, high-end Roush Performance vehicles and parts for your Ford Mustang or F-150. Our specially trained ROUSH Performance experts will help you with ordering aftermarket performance parts, performance crate engines and performance part installation. Baxter Ford will also assist with purchasing an official ROUSH vehicle assembled at ROUSH Performance’s Plymouth Township, Michigan facility. Take your Ford Mustang or F-150 to the next level with ROUSH Performance packages. 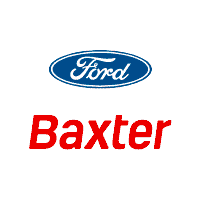 Call the Baxter Ford Roush Performance Manager, Kevin Putman, at 855-670-0086. ROUSH Mustangs feature advanced engineering and technologies personally tested by racing legend Jack Roush. Whether it be a Stage 1, Stage 2 or Stage 3 – each ROUSH Mustang is built to deliver quality high performance. With the introduction of the 4-cylinder EcoBoost Mustang, ROUSH has taken the opportunity to provide an even more diverse selection of models. The 2.3L turbo-charged engine provides both more power and fuel efficiency than the already impressive Ford 6-cylinder Mustang. The base 2016 I-4 EcoBoost Mustang is rated at an whopping 21mpg city / 32mpg hwy and 310hp / 320lb-ft.
ROUSH has taken this system and added its unique vision for the vehicle, with 17 core component upgrades, including an aggressive front fascia, front grilles, a front chin splitter, rear decklid spoiler, the 2016 ROUSH Mustang Exhaust System with Quad Tips, and more. There is also a wide variety of optional components, including side rocker graphics, 20-inch wheels with ultra high performance tires, hood graphics, instrument gauge cluster, body side scoops, and the innovative ROUSH Active Performance Exhaust System. Learn more about the 2016 ROUSH Stage 1 Mustang. 5.0L V8 power has long been the cornerstone of the Mustang legacy. Ford has once again evolved the platform with its 2016 GT Mustang, bringing power up to 435hp / 400lb-ft from the 2014 model’s 420hp / 390lb-ft. The 2016 ROUSH Stage 2 Mustang takes this system and adds an abundance of performance enhancements, including a racing inspired front fascia and rear wing, high flow upper and lower front grilles, “ROUSH” badging and graphics, a newly-design ROUSH wheel with ultra high performance Cooper RS3 tires, and more. With a complete range of ROUSH-only features, including the front windshield banner, Stage 1 upper grille badge, ROUSH “R” fender badges, decklid badge, and much more, you will steal the eyes on the road. Learn more about the 2016 ROUSH Stage 2 Mustang. 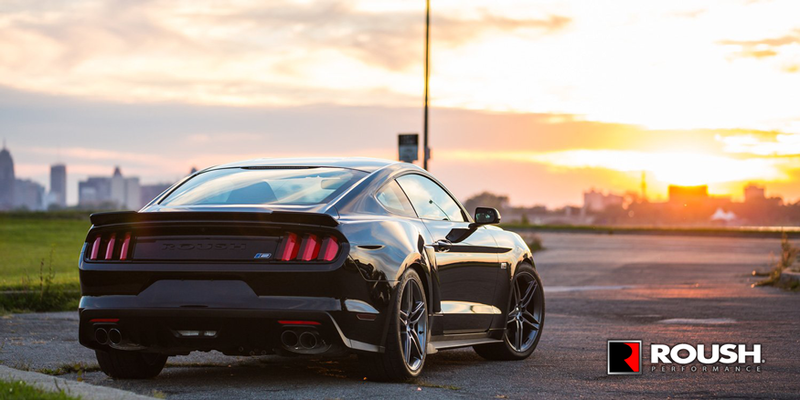 You can hear the Stage 3’s power pulsing through an innovative new ROUSH Active Performance exhaust system. 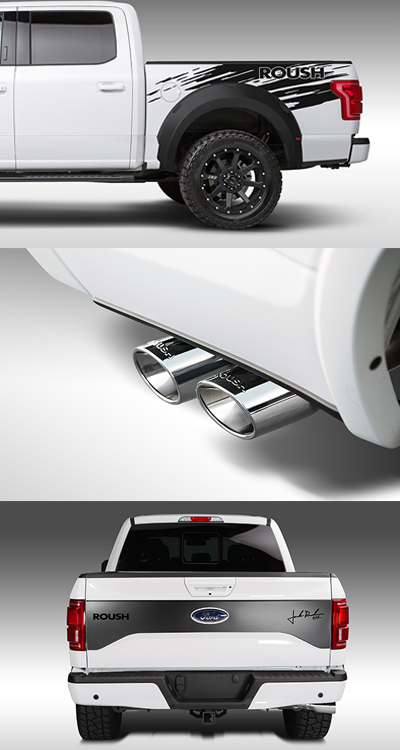 This game-changing system gives full control over the volume and tone coming from a Quad-Tip Stainless steel ROUSH exhaust. Select modes ranging from the subtle “touring” mode, dynamic “sport” mode, and wide-open “track” mode. With the “custom” mode you can program your own dynamic profiles with virtually infinite sound possibilities, right from your mobile device. Learn more about the 2016 ROUSH Stage 3 Mustang. While the ROUSH Performance namesake conjures up images of aggressive and powerful Mustangs, the newest addition to the ROUSH Performance line-up brings with it a whole new level of brawn. The base of the 2016 ROUSH F-150 is Ford’s new aluminum body, enhanced with body components, ROUSH graphics, a ROUSH Side-Exit Exhaust System, interior components, and an all-new option for 5.0L V8 F-150s – a ROUSH 2300 TVS Supercharger.2016 ROUSH F-150s equipped with an industry-leading calibrated ROUSH F-150 Supercharger produce an incredible 600 horsepower and 557 lb-ft of torque. These superchargers feature Eaton’s Twin Vortices Series technology with twin four-lobe rotors twisted 160-degrees, and are painstakingly designed, developed, and engineered in-house at ROUSH Performance. The 2016 ROUSH F-150 is equipped with a number of appearance upgrades including a ROUSH Front Grille with Clearance Lightning, a ROUSH Front Bumper Cover, ROUSH Fender Flares with Clearance Lighting, a square “R” Hitch Cover, and a ROUSH License Plate and Frame. An aggressive ROUSH Side-Exit Exhaust System has been added to provide that deep signature rumble craved by ROUSH enthusiasts. Learn more about the 2016 ROUSH F-150.